The neem tree is noted for its drought resistance. Normally it thrives in areas with sub-arid to sub-humid conditions, with an annual rainfall of 400–1,200 millimetres (16–47 in). It can grow in regions with an annual rainfall below 400 mm, but in such cases it depends largely on ground water levels. Neem can grow in many different types of soil, but it thrives best on well drained deep and sandy soils. It is a typical tropical to subtropical tree and exists at annual mean temperatures of 21–32 °C (70–90 °F). It can tolerate high to very high temperatures and does not tolerate temperature below 4 °C (39 °F). Neem is one of a very few shade-giving trees that thrive in drought-prone areas e.g. the dry coastal, southern districts of India, and Pakistan. The trees are not at all delicate about water quality and thrive on the merest trickle of water, whatever the quality. In India and tropical countries where the Indian diaspora has reached, it is very common to see neem trees used for shade lining streets, around temples, schools and other such public buildings or in most people's back yards. In very dry areas the trees are planted on large tracts of land. In April 2015, A. indica was declared a class B and C weed in the Northern Territory, Australia, meaning its growth and spread must be controlled and plants or propagules are not allowed to be brought into the NT. It is illegal to buy, sell, or transport the plants or seeds. Its declaration as a weed came in response to its invasion of waterways in the "Top End" of the territory. The tender shoots and flowers of the neem tree are eaten as a vegetable in India. A souplike dish called Veppampoo charu (Tamil) (translated as "neem flower rasam") made of the flower of neem is prepared in Tamil Nadu. In Bengal, young neem leaves are fried in oil with tiny pieces of eggplant (brinjal). The dish is called nim begun and is the first item during a Bengali meal that acts as an appetizer. It is eaten with rice. 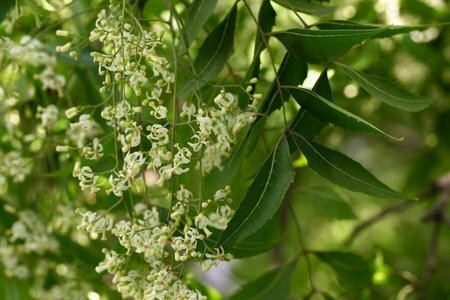 Neem is used in parts of mainland Southeast Asia, particularly in Cambodia aka sdov—ស្ដៅវ, Laos (where it is called kadao), Thailand (where it is known as sadao or sdao), Myanmar (where it is known as tamar) and Vietnam (where it is known as sầu đâu and is used to cook the salad gỏi sầu đâu). Even lightly cooked, the flavour is quite bitter and the food is not enjoyed by all inhabitants of these nations, though it is believed to be good for one's health. Neem gum is a rich source of protein. In Myanmar, young neem leaves and flower buds are boiled with tamarind fruit to soften its bitterness and eaten as a vegetable. Pickled neem leaves are also eaten with tomato and fish paste sauce in Myanmar. In the Indian states of Andhra Pradesh, Karnataka and Telangana, Neem flowers are very popular for their use in 'Ugadi Pachhadi' (soup-like pickle), which is made on Ugadi day. In Andhra Pradesh, Karnataka, and Telangana, a small amount of Neem and Jaggery (Bevu-Bella) is consumed on Ugadi day, the Telugu and Kannada new year, indicating that one should take both bitter and sweet things in life, joy and sorrow. Neem-coated urea is being used an alternate to plain urea fertilizer in India. It reduces pollution, improves fertilizer's efficacy and soil health. The name "Nimai", a reference to this legend, means "of the neem tree" and trends at 5-10 babies per million. In 1995, the European Patent Office (EPO) granted a patent on an anti-fungal product derived from neem to the United States Department of Agriculture and W. R. Grace and Company. The Indian government challenged the patent when it was granted, claiming that the process for which the patent had been granted had been in use in India for more than 2,000 years. In 2000, the EPO ruled in India's favour, but W. R. Grace appealed, claiming that prior art about the product had never been published in a scientific journal. On 8 March 2005, that appeal was lost and the EPO revoked the Neem patent.